In October 2018 BVQ members made 24 beautiful quilts and 78 pillowcases! In June 2018 BVQ completed 16 quilts and 54 pillowcases! Each month the pillowcases go directly to Hayes Sewing Machine Company, who are a drop off point for Ryan's Case for Smiles (previously Conkerr Cancer). You can read more about this organization at caseforsmiles.org. Recent donations of quilts have gone to Child, Inc (6), The Salvation Army (6), Lutheran Community Services (23) and the YWCA Delaware (40). Each drop-off has been met with awe for the beauty of the quilts and gratitude for what the quilts will mean for people that own very little and appreciate a gift that really brighten their day. Child Inc is a private, non-profit organization that offers prevention, treatment, emergency shelter and advocacy for children. The Salvation Army is committed to doing the most good for the most people in the most need, serving the poor and homeless. Lutheran Community Services (LCSDE.org) serves low-income families in Delaware with emergency food, housing and other services. And the YWCA Delaware leads critical social change, empowers women, girls and their families to achieve their full social and economic potential and offers programs to almost 4,000 Delawareans a year in the five key areas of Economic Empowerment, Housing, Racial Justice, Sexual Assault Crisis and Youth Empowerment. Safe Harbor of Greater West Chester, Inc. – (polar fleece hats and scarves) Click HERE for directions. There are charity quilts kits in the rear of the meeting room on the table. Please feel free to take one. Be as creative as you like. If you need batting and backing please see Heather Smalley (email orissarun@msn.com or 610.399.4926). Members, please leave your completed charity quilt on the table at the rear of the meeting room. Our Charity Committee will deliver them to organizations in need. If you have any questions or concerns please feel free to contact Elaine O'Connell or Terry Lieberman. Infant Quilt: 36" x 36"
Baby quilt: 36 6½" blocks set 6 x 6. Toddler’s quilt: 40" x 48" (approx. ); should be quilted rather than tied. 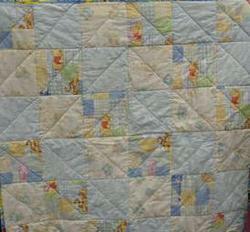 Or make an “Easygoing Quilt" See pattern HERE! Use juvenile prints for baby/child’s quilts or appropriate colors/prints for adult quilts...from your stash or the quilt shop (a good excuse to go fabric shopping! ), or pick up a kit at the Guild meeting. A good opportunity to practice your machine quilting! If you want one of our longarmers to quilt it, please cut the backing 4 inches per side larger than the top. Note: Baby quilts must be quilted (not tied). NEED IDEAS?? See patterns or request a kit from the Quilts for Kids website (﻿www.quiltsforkids.org/patterns/﻿).